The LibAnswers address book allows you to store email addresses that you want to include in ticket correspondence, but whose owners do not need to be given user accounts in LibAnswers. For example, you may often want to send your IT help desk or finance office internal notes for tickets about certain issues. By adding them to your Address Book, they will appear as options when choosing the recipients for internal notes -- just like if they had a full LibAnswers user account. But, because they do not have user accounts, they are only able to interact with the system via email -- they cannot actually log into LibAnswers to view and reply to tickets. This can help avoid adding a large number of users to your system, while also keeping your ticket workflow as simple as possible for address book recipients. All they need to do is reply to an email to follow up on a ticket. CC the address on ticket replies. That address will receive an email notification of the reply. By replying to the email, they can send a response to the asker, owner, and other CCs. Send the address an internal note. That address will receive an email notification of the note. By replying to the email, they can send an internal note in response. "Assign" a ticket to the address. This is similar to sending an internal note in the sense that the address, with the exception that the ticket will be closed with a note that it was assigned to that address. This does not actually change ownership of the ticket to the address book entry, however. This simply allows you to indicate that the ticket will be handled outside of LibAnswers by the recipient. If a patron subsequently replies to the ticket, the status will return to Open and the owner will be notified. Click on the Manage the Address Book tab. To add a new entry to the address book, click on the Add Address Book Entry button and enter the recipient's First Name, Last Name, and Email Address. To edit an address book entry, click on its edit () icon in the Actions column. 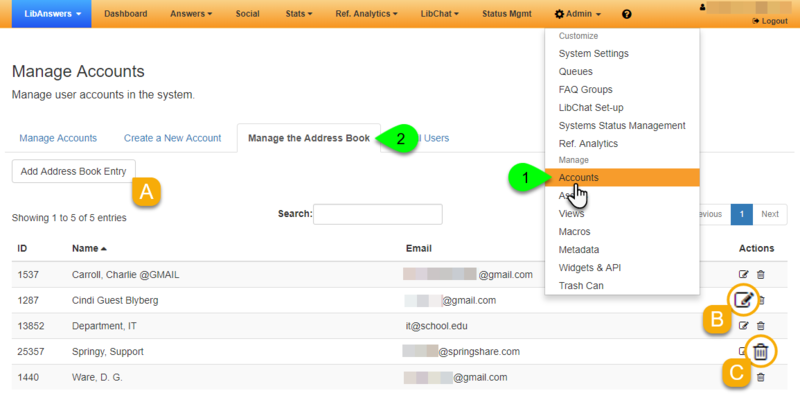 To remove an address book entry, click on its trash can icon () in the Actions column.